It’s one thing to talk the talk about renewable energy and another thing entirely to actually take action. The U.S. Midwest is apparently walking-the-walk, as companies and state governments are investing into one of the top renewable energy sources of wind power. The generation of power from wind sources has reached a 10,000 MW level, which, when translated into energy equates to twenty five percent of the energy generation used at this time. This is an unprecedented step in an absolute right direction as the Midwest states take an intelligent choice in renewable energy. Taking advantage of the local renewable energy sources is what it is all about and Midwest states have committed to these actions. Their commitment has been taken beyond just a level of request, but has been enacted as requirements into state laws. There are currently over 11,000 MW of wind generation installations with projects in development or under construction of around 7,000 MW. To translate this information into something that we can understand, one megawatt can power around one thousand homes. However, with that said, it must be understood that wind farms have energy production that only occurs when the wind actually blows. This reduces the numbers to around three hundred homes. Even with this reduction, it is an incredible feat to have accomplished. 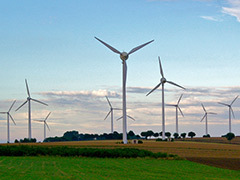 The increase of wind power as a renewable energy source is on the rise to meet the demands of the public. Wind power represents a fantastic investment for clean energy, with the ability to meet and potentially exceed future demands. Of course, wind power is not a single source answer. When combined with other renewable energies, the potential is to not only match the demand, but add additional energy back into the grid for potential fluctuations and needs. It seems that the power of the people is now being heard. Posted on July 26th under Wind Energy Systems. If these people can make such astoundingly great decisions, why can’t the rest of the country? Oh, we know everything is enveloped in the grand illusion of what profits can be made, but these are some great long term investment ideas that are really going to pay off. Three cheers for the Midwest. There is something to be said about their individualism and courage in taking steps to move to renewable energy. There is a staunch attitude in the Midwest that focuses on the sheer logic of the situation and they saw the balance in these projects as well as dollar savings that can be passed down to the people. Whether wind, water or earth, the renewable and sustainable energy concept is the best way we can get rid of our oil dependency. Each area of the country needs to focus on what they can use to the best of their abilities. This will bring a major big time savings, but also more jobs and we won’t have to keep drilling for oil or buying it from the Middle East. This is a winner, no matter how you look at it, and it’s about time someone took a step in the right direction.